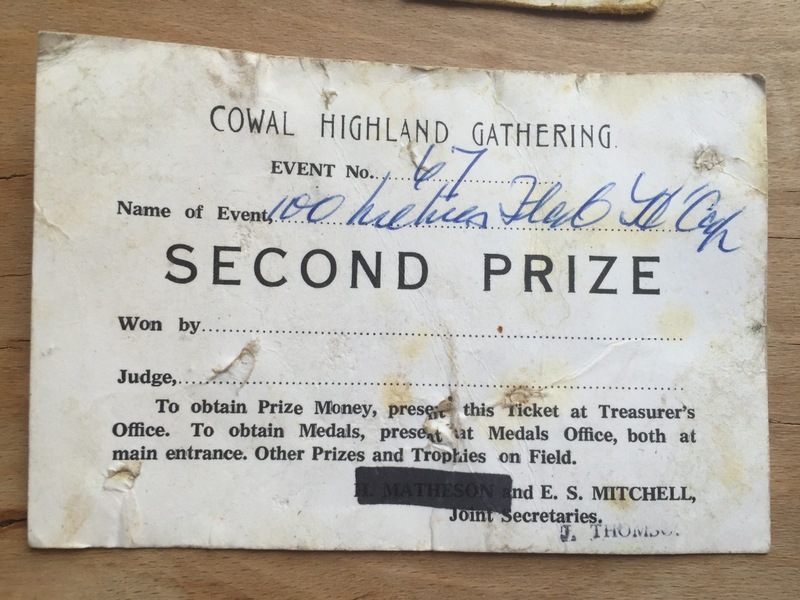 Of all the Highland Games meetings, Cowal was probably the best known among the general public and among athletes it was seen as a two-day meeting, a well sponsored meeting (they paid expenses for invited teams! ), and the one with the biggest crowds by far. Clubs took buses to Cowal – it was a long drive – and many athletes went by train to Craigendoran (at Helensburgh) and then went by boat to Dunoon. The journey, whether in a busload of friends or by train and steamer, was part of the whole day. And the quality of the athletics was always high. When I started going there, there were only six teams invited to the two miles team race and one of them was always an English club. We were sharing the dressing room and lining up with the best of Longwood and Saltwell Harriers, for instance. Running at Cowal was a dream of a day for men who normally had to pay money and travel to England to race these guys. Everett was out again in the medley relay where the Shettleston team won (Everett, McNulty, Meggat, Dewar) from Garscube and Ayr Seaforth. Another Englishman won the event in 1960 – John Anderson of Saltwell Harriers winning from Bill Kerr (Victoria Park) and Eddie Sinclair of Springburn in 9:05.7. Team victors were Victoria Park (15 points) from Bellahpouston (21) and Springburn (24). The West District relay was included on the programme and as won by Victoria Park (Dunbar, Turner, Hildrey and Whitlock) in 42.3, a native record, from Larbert YC and Ayr Seaforth. The medley relay was Seaforth from Bellahouston and Liverpool Harriers. The inter-club component was important to the development of the athletes and the sport and to be representing your club before tens of thousands of spectator at what was an international gathering gave the athletes a real shot of adrenalin. The Rangers Sports were still going strong but they had no inter-club element to them – they fulfilled another function. The team race was won by Shettleston Harriers (20) from Bellahouston Harriers . Bellahouston had their consolation when they won the medley relay from Liverpool Harriers and Seaforth AC. Their winning team of Currie, LaPointe, Robertson and Greig was timed at 3:35.5. The West District Relay was again won by Victoria Park whose team was Ballantine, Hamilton, Hildrey and Whitlock in 43.2 seconds. The only other invitation event was the Youthe 880 yards which was won by Hugh Barrow (VPAAC) in 1:57.2 from Jim Johnston and Jim Finn (both Monkland). On the second day of the 1962 meeting John Anderson achieved a notable double when he won the invitation mile as well as the two miles. The photograph in the ‘Glasgow Herald’ showed three men straining for the line – Anderson, Ibbotson and Jim McLatchie with times of 4:08.9, 4:09.9 and 4:09.9. The Two Miles was another hard race between the two Englishmen with Anderson’s 8:56.6 beating Ibbotson’s 9:01.2 and John Hillen (Saltwell) in 9:01.4. As they took the eye of the photographer and the spectating masses, there was a hard team race taking part which was won by Motherwell YMCA. The Medley Relay was won by Bellahouston (Currie, McGaw, LaPointe and Greig) from a fast finishing Seaforth AC and Liverpool Harriers in 3 min 31.7 sec. Bellahouston (Mayberry, McGaw, LaPointe and Rae) also won the West 4 x 110 yards relay in 43.6 seconds from Seaforth and Clydesdale. Ibbotson had enjoyed his previous experiences at Dunoon so much that he brought his wife Madeleine up in 1962 and she won a women’s invitation 880 yards from Scotland’s Georgena Buchanan and Ireland’s Maeve Kyle.in 2:16.0. 31st August, 1963, was another good day for JP Anderson of Saltwell. The ‘Glasgow Herald’ report read: JP Anderson was one of the most successful competitors at the annual Cowal Games on Saturday at Dunoon. He won the invitation two miles in the most satisfactory time of 8:54 on a track that had been made soft and heavy by continuous rain. There was never ever doubt about Anderson’s ability, for when he decided to take control of the race all that was left was to see who was going to be second. In the circumstances young I McCafferty (Motherwell YMCA) showed considerable ability, for in determined fashion he beat the more experienced JJ Hillen (Saltwell) for second place in 9:00.2 for his personal best and the best time ever shown by a junior. Motherwell again won the team race with 15 points with the brothers AH and AP Brown the supporting members for McCafferty. Bellahouston Harriers retained the Western District 4 x 110 yards relay championship. Ayr Seaforth and Clydesdale were again second and third respectively. Saltwell Harriers was second in the two miles with 30 points and the medley relay was replaced by the SAAA junior medley relay which was won by Victoria Park (Laurie, Smith, Lappin and Wood from Edinburgh Southern and Seaforth. This was Anderson’s third year at Cowal, and Ibbotson had been there twice. What was the attraction? The arena consisted of an ash track round a very tight infield. On the infield there was always (a) two pipe band circles, (b) a highland dancing platform, (c) a wrestling competition and the runners had to warm up around them, keeping an eye out for the pipe bands marching into the arena. On the outside of the track there was a crowd of 40000 or 50000, so close to the track that the athlete in the outside lane could shake hands with the spectators. It was a very intense experience. Cowal was always a two-day meeting with an incomplete programme on the Friday with most of the standard track events, then on the Saturday with a complete programme of events. This enabled distance men to run two races, sometimes three, over the weeend. On 29th August, 1964, young Hugh Barrow took the plaudits. On the Friday evening he set a new SAAA record for the rarely run three-quarter mile distance of 3:00.5, just beating John McGrow on the line. He would go on to equal this time twice – at Airdrie in 1968 and 1969 – but never to beat it. Not content with that, he was out for his club on the Saturday in the two miles team race. Second in the two miles to Derek Ibbotson, who won in 8:49.4, he set a personal best time by no fewer than 11 seconds when he ran 8:54. Ian McCafferty was third in 8:59.4. Glasgow University (McGeoch, Gibbons, Ewan and Campbell) won the Western District 4 x 110 yards in 43.1 seconds from Seaforth and Clydesdale. The SAAA Junior 4 x 110 yards was won by Bellahouston (Carmichael, Brown, Symeonides and Ritchie) from Edinburgh Southern and Victoria Park in 44.1 sec and in the SAAA Junior medley relay (440 + 220 + 220 + 440), Bellahouston (Baillie, Carmichael, Ritchie McLean) beat Ayr Seaforth and Victoria Park in 2:28.6. Bellahouston Harriers won all three relays that year – the West District 4 x 110 yards, the SAAA Junior 4 x 110 championship and the SAAA junior medley relay championship. 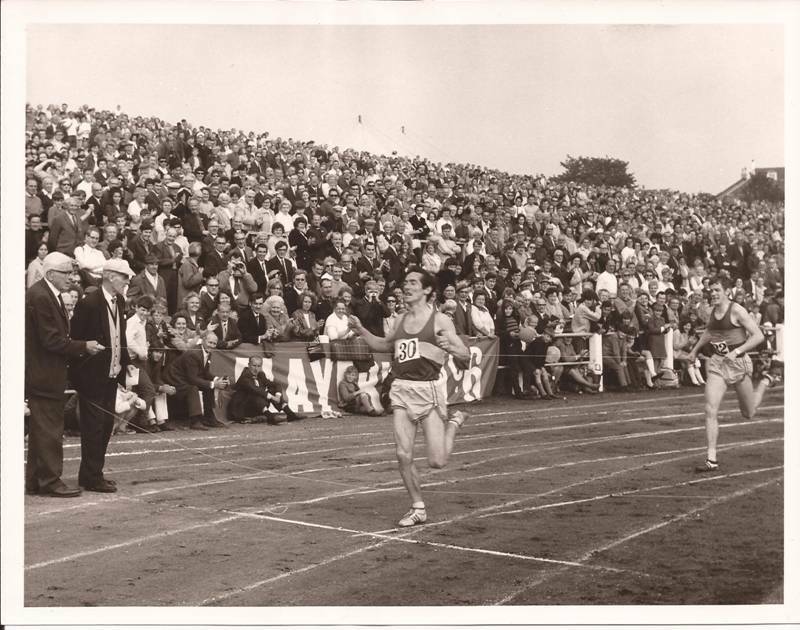 The 1966 Games 440 yards invitation race was a personal triumph for Hugh Baillie of Bellahouston Harriers who won in 48.7 but the two miles team race where the country’s top clubs faced each other was as hotly contested as ever. Ian McCafferty (Motherwell YMCA) won from Hugh Barrow (VPAAC) by 17 seconds. Only Barrow attempted to go with him and their times at the finish were 8:42.2 and 9:05.6. McCafferty had come through the first mile in 4:21. Motherwell won the team race, as they did at so many venues in the 1960’s, with 9 points (1, 3, 5). In the relays, Bellahouston (Williams, Symeonides, Baillie and Carmichael) won the SAAA West District 4 x 110 yards in 43.4 seconds, and with a team of Johnstone, Wood, McAlpine and Wallace) the SAAA Junior 4 x 110 yards in 46.3. Edinburgh Southern Harriers (Hay, Miller, Railton and Stewart) however won the SAAA Junior medley relay in 2:32.2 from Bellahouston. It is interesting to reflect on what effect all this head-to-head racing of runners of all standards at the various meetings had on standards generally in Scottish athletics. It should be borne in mind that Cowal was not as easily reached as all the other central belt venues – Gourock, Ibrox, Shotts and the rest were all well attended and the top men, the clubmen and the young pretenders all faced their own rivals on tracks around the country week in, week out and although the times were not good the lessons in hard racing were learned and perfected. Star turn in 1967 was Lachie Stewart’s one hour run on the Friday evening in which he covered 12 miles 188 yards to set a new Scottish record. He also ran in the two miles on the Saturday and although always up at the front of the field, he dropped back allowing Ian McCafferty to win in 8:59.4 seconds leading Motherwell to team victory with 8 points(1, 3, 4). McCafferty also won the mile from Hugh Barrow in 4:03.1. The relays? The West District 4 x 110 was won by Garscube Harriers in 44.4 seconds after the ‘winning’ team from Victoria Park had been disqualified despite being well ahead at the finish, the SAAA Junior 4 x 110 yards was won by Shettleston Harriers in 44.8 seconds and the SAAA Junior medley relay championship was won by Shettleston in 2:32.2. Cowal continued to be good meeting but the point has been made about the inter club element being an important factor. Man against man is what the sport is about but the club element where runners challenge themselves against their equals or betters for their club, when they would not do so for themselves, has always been an important factor in athletes development.